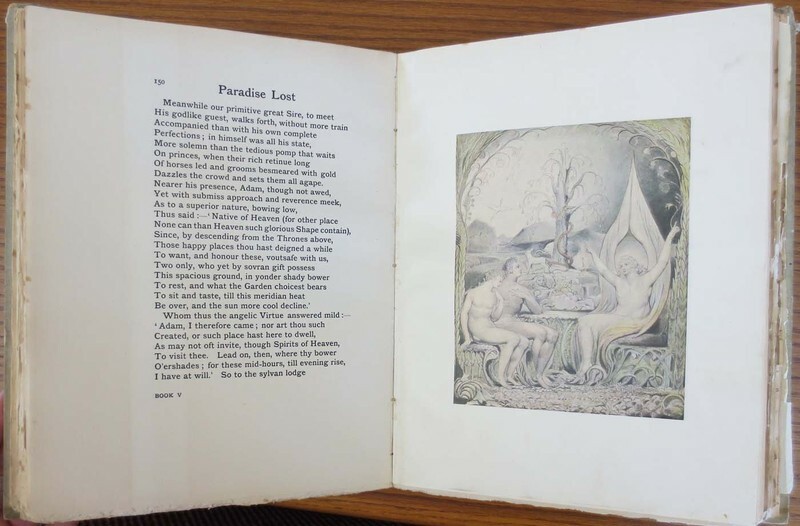 Paradise Lost by John Milton / Illustrations by William Blake. Liverpool, England: Printed at the Lyceum Press for the Liverpool Booksellers' Co., Ltd., 1906. William Blake began his illustrations in watercolor for Paradise Lost in 1806. Two separate sets of illustrations are extant today. For some scholars, Blake's illustrations for Paradise Lost are among his most impressive book illustrations and the best of all his Milton illustrations. The designs are carefully composed and executed and show a great richness of detail and finish. Blake's illustrations did not form a part of any published edition until this 1906 Lyceum Press edition.